1. 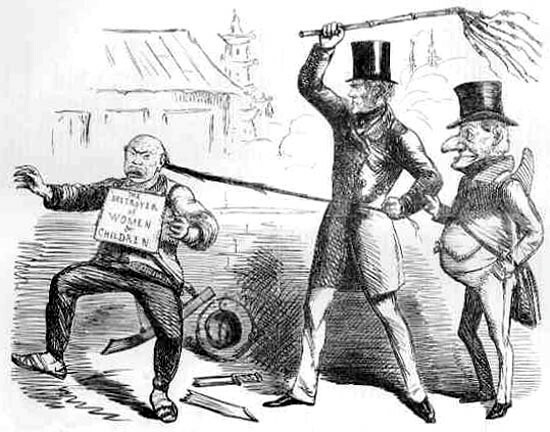 戻る “A Lesson to John Chinaman” (Punch, 9 May 1857), Victorian Web, 12 April 2004. 2. 戻る Jonathan Parry, “Lord Palmerston”, The National Archives, 7 April 2016, Prime Minister’s Office, Government of U.K.
”Resolution Moved, Resumed Debate (Fourth Night), House of Commons, 03 March 1857. 4. 戻る “Benjamin Disraeli, the Earl of Beaconfield”, Past Prime Ministers, Gov. U.K.
5. 戻る Lowe, K. & McLaughlin, E. (2015). “’Caution! The Bread is Poisoned’: The Hong Kong Mass Poisoning of January 1857”, The Journal of Imperial and Commonwealth History, 43 (2).